There will be a parish advisory council meeting at 6:30 on Tuesday, August 21. Our parish is blessed to have a copy of the Miraculous Icon of Our Lady of Zarvanytsia. 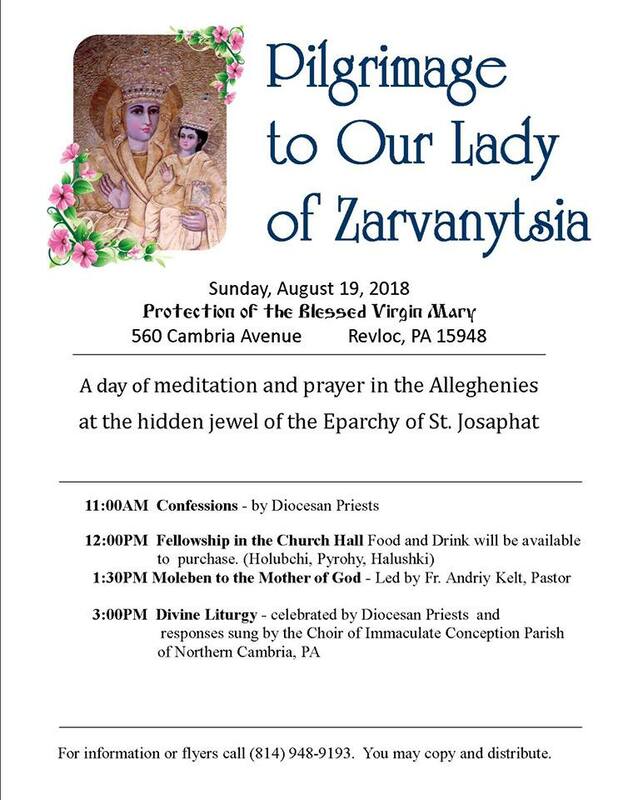 Since many of us cannot travel to Zarvanytsia, Ukraine, we will honor the Mother of our Lord and Savior, Jesus Christ here in Revloc, PA. All are invited to share in this special day for our parish. Because of the pilgrimage, there will be no 11 AM Divine Liturgy. Instead, the Sunday Divine Liturgy will be at 3 PM on this day. December 9, 2017 from 6:00 to 8:00PM. Weekday Liturgy will be on Tuesday at 6:00PM due to choir practice after church.